Most cases of idiopathic thrombocytopenic immune thrombocytopenia purpura (ITP) in children occur before 5 years old, show spontaneous remission under careful observation, and resolve with the use of first-line treatments such as steroids or high-dose immunoglobulin. ITP often develops after viral or bacterial infection, or after vaccination. Severe bleeding symptoms and severe thrombocytopenia (<20 × 109/L) are rare but often become refractory. 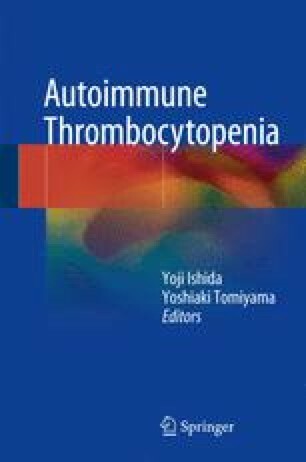 Second-line treatments such as rituximab and thrombopoietin receptor agonists have recently been used for ITP in children, in place of splenectomy. An objective ITP-bleeding assessment score seems necessary for management guidelines and selection of objective treatment in the future. Member of the Committee on Platelets of the Japanese Society of Pediatric Hematology/Oncology. Yamazaki T, Shibuya A, Ishii S, Miura N, Ohtake A, Sasaki N, Araki R, Ota Y, Fujiwara M, Miyajima Y, Uetake K, Hamahata K, Kato K, Kawakami K, Toyoda H, Moriguchi N, Okada M, Nishi M, Ogata Y, Takimoto T, Ohga S, Ohta S, Amemiya S. High-dose Cepharanthine for pediatric chronic immune thrombocytopenia in Japan. Pediatr Int. 2016; doi: 10.1111/ped.13151 [Epub ahead of print].